ĐỒNG NAI — A traffic police officer was killed on Saturday while on duty on Nation Route 1A in Biên Hòa City’s An Bình Ward. Major Lê Quang Minh, 41, was run over by a truck while trying to stop the vehicle at the Đồng Nai toll station, the Tiền Phong (Vanguard) newspaper reported yesterday. The driver of the truck, who has not been identified, escaped. 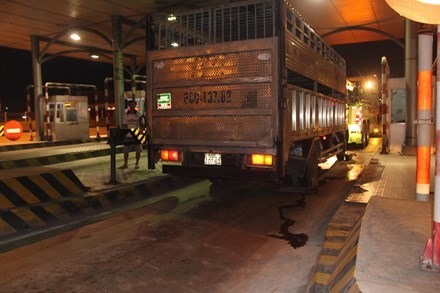 According to authorities, at 7:15 pm a patrol team from the Đồng Nai traffic police division ordered the driver of a truck, licence plate 60C-107.62, to stop at the toll station. The truck was running from Vũng Tàu City to HCM City when police attempted to stop it. The driver did not comply and continued driving through the toll station. Major Minh pursued the vehicle, which then stopped. In the middle of a discussion with the officer, the driver got back into the truck and drove away. In attempt to stop the vehicle, Major Minh clung to the left rear view mirror of the truck, fell and was run over by a left wheel.